If you live in Lake Wildwood, Rough & Ready, Smartsville, Penn Valley, on Beale Air Force Base or off McCourtney or Lime Kiln Roads, you’re on ground zero for the Nisenan People of Nevada County, the land of broken promises. Long before houses and roads were built, this land was designated in a treaty between the local tribes and the United States Government. Tribal Headmen gave careful consideration to where the boundary lines would be drawn. Their decisions were based on changing elevations and food sources. The traditional Native way of life depended on moving with the seasons according to when plants were ready for harvest or when game was available. Village sites with significant populations along Deer Creek in Nevada City were released in good faith for the promised lands. 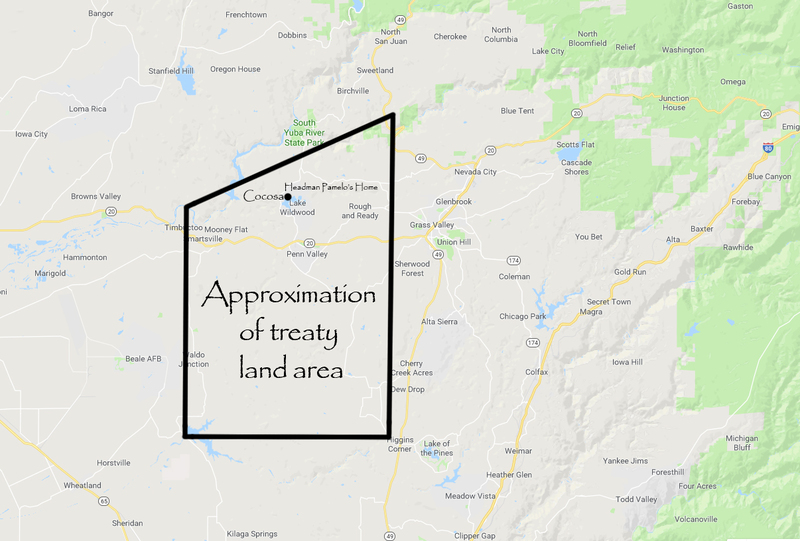 Approximation of treaty land made between the United States and Indian Headmen. The Nisenan way of life changed drastically during the Gold Rush era. For the Nisenan and other Native American tribes, colonial settlement was more devasting than the European Holocaust. Statistics estimate that 60% of European Jews were murdered in World War II. For California Indians, white pioneers reduced their population by nearly 90%. Due process. The Native People trusted it. Yet the treaties they worked so diligently to form remained in a drawer, unratified by the other party. It was a colossal ‘gotcha’ that remains an unresolved wound on the face of the Nation. If you found this post informative, you may also like Nisenan Book Review, Culture & Healing Historic Trauma, Anthony House Aflame Under Lake Wildwood or Tumbuctoo – Hydraulic Mining & First Land Use Limit Law. To read the 1850’s treaties and follow the sequence of historic events, visit Shelly Covert’s website. Shelly is the Tribal Spokesperson for the Nevada City Rancheria.